On a panel moderated by Hannah Patterson, BAFTA Sessions speaks with screenwriters Deborah Davis (The Favourite), David Rabinowitz & Charlie Wachtel (BlacKkKlansman), and Will Fetters (A Star is Born). It’s that time of year - enjoy The Hollywood Reporter’s 2019 Writers Roundtable with Oscar-nominated screenwriters John Krasinski (A Quiet Place), Peter Farrelly (Green Book), Tamara Jenkins (Private Life), Bo Burnham (Eighth Grade), Eric Roth (A Star Is Born), and Paul Schrader (First Reformed). Writers Guild of America West screenwriters weigh in on the ‘No Writing Left Behind’ initiative. The Writers Guild Foundation interviewed two time Academy Award winning screenwriter William Goldman (Butch Cassidy and the Sundance Kid, All the President’s Men, Marathon Man, Misery, The Princess Ride) in 2010. New in print from Harry N. Abrams is Wet Hot American Summer: The Annotated Screenplay, written by Michael Showalter and David Wain. "At long last, this is the definitive Wet Hot American Summer book fans have been clamoring for! Screenwriters David Wain and Michael Showalter take pen to page and create a hilarious, behind-the-scenes annotated version of the original screenplay that launched a thousand Halloween costumes. They provide commentary on and insight into how and why they made the artistic decisions they did while writing and filming the movie that went on to become a true cult classic, as well as an ongoing Netflix series. The book will also feature reproduced ephemera from filming - photos, original (and scathing) reviews, AIM chat conversations, marked up script pages, and so much more. Written and curated by Wain and Showalter, this will be the must-have guide to all things Wet Hot." Wet Hot American Summer, released in 2001, was directed by Wain, and stars Janeane Garofalo, David Hyde Pierce, Paul Rudd, Christopher Meloni, Marguerite Moreau, Molly Shannon, Michael Ian Black, Amy Poehler, Elizabeth Banks, Bradley Cooper, and Michael Showalter. Wet Hot American Summer: The Annotated Screenplay is available now in hardcover and Kindle editions. Writer-director Eli Roth’s History of Horror premieres tonight on AMC. Today, October 11th is the final deadline to enter NYC Midnight’s Short Screenplay Challenge. The first challenge launches on Friday, October 12th with the subsequent challenges starting on November 30th, January 11th, and February 22nd. Here is The Wrap’s talk with Nicole Taylor, writer of Wild Rose, at the Toronto International Film Festival. For Variety’s Playback podcast, Kris Tapley went behind the scenes of Mission: Impossible - Fallout with writer-director Christopher McQuarrie. The /Film Daily podcast interviewed Bart Layton, writer-director of American Animals. Daniel John Carey, founder of the Los Angeles-based Screenwriting Tribe, has put the best advice learned from the group's weekly workshops to paper, resulting in today's release of Screenwriting Tribe: Workshop Handbook for Writing and Polishing Film and TV Spec Scripts. "For both beginners and working screenwriters, Screenwriting Tribe Workshop Handbook provides a vast quantity of information to help writers polish their screenplays to the professional level. While working in the headquarters of a film studio, John saw how easily screenplays are dismissed because of formatting errors, badly written description, rambling dialogue, and other common script problems. One day, the studio president said to him, “Why should I spend time reading a script if the writer hasn’t spent the time to polish it?” To help writers polish their scripts to be what is expected by managers, agents, studio readers, producers, directors, screenplay contests, and fellowship programs, John started the weekly workshop that he named Screenwriting Tribe. The membership quickly grew to include several hundred writers and actors. Over the years, John compiled information helpful for those writing screenplays. At first, he was writing a booklet for his workshop, but it turned into the nearly 300-page Screenwriting Tribe Workshop Handbook that is now available to all writers. In addition to running Screenwriting Tribe workshop, John helps writers, directors, and producers polish scripts to get them ready for sale and/or production." Screenwriting Tribe: Workshop Handbook for Writing and Polishing Film and TV Spec Scripts is available in paperback now. Lessons from the Screenplay looks at 'The Midpoint Collision,' using Stuart Beattie's script for Michael Mann's film Collateral to examine when the "protagonist’s facade is slowly stripped away as their inner self is forced to rise, and what happens when these two sides of the character collide at the midpoint of the story." New in print today from Faber & Faber is Annihilation: The Screenplay, written by Alex Garland (The Beach, 28 DaysLater..., Ex Machina) and based on the book of the same name by Jeff VanderMeer. "A group of soldiers enters an environmental disaster zone and only one comes back out alive, though he is grievously injured. In an attempt to save his life, his wife Lena, a biologist, volunteers for a second expedition into the zone to figure out what happened to him." Annihilation was also directed by Garland, and stars Natalie Portman, Jennifer Jason Leigh, and Oscar Isaac. 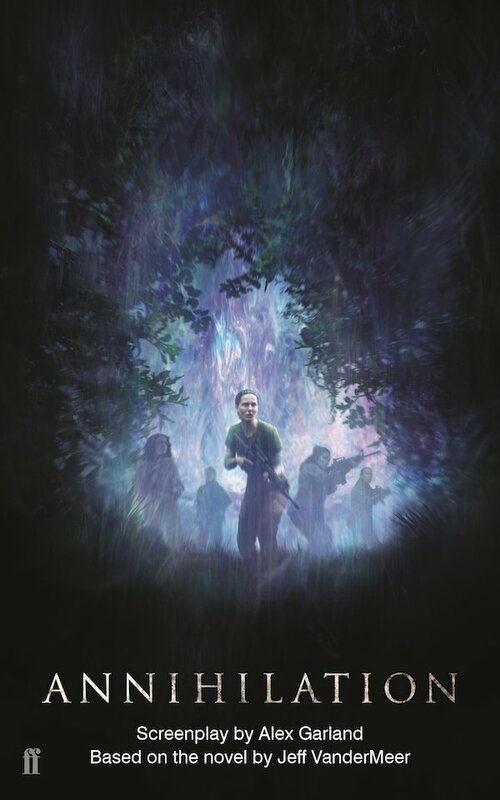 Annihilation: The Screenplay is available now in paperback and Kindle editions. From being occasionally vague to mute culprits, buried clues to signatures descriptions, Just Write examines 'How J.K. Rowling writes mysteries that are "solvable and incredibly satisfying to read." James Cameron's new series telling the 'Story of Science Fiction' through questions about key themes of the genre launches tonight on AMC at 10pm ET with 'Aliens,' the episode that asks Steven Spielberg, Ridley Scott, Sigourney Weaver, and others "what can aliens teach us about ourselves?" AMC says "...this documentary series explores the evolution of sci-fi from its origins as a small genre with a cult following to the blockbuster pop-cultural phenomenon we know today. In each episode, James Cameron introduces one of the “Big Questions” that humankind has contemplated throughout the ages and reaches back into sci-fi’s past to better understand how our favorite films, TV shows, books, and video games were born, Cameron and his contemporaries – Steven Spielberg, George Lucas, Ridley Scott and many more who have helped fuel sci-fi’s spectacular growth over the last several decades – debate the merits, meanings, and impacts of the films and novels that influenced them and discuss where the genre — and our species — might be going in the future." The Star Wars Show speaks with Solo: A Star Wars Story screenwriters Lawrence Kasdan (The Empire Strikes Back, Raiders of the Lost Ark, Body Heat, The Big Chill) and Jonathan Kasdan (Dawson's Creek). ScreenPrism asks 'How do you make dialogue scenes compelling and interesting?' and says Netflix's Mindhunter is an example of dialogue done right. From Adventure to Zaxxon, author and screenwriter Ernest Cline explains the story behind every video game that he included in Ready Player One. All original content is copyright © 2010-2018 Michael Sajkowicz. All other content is owned by their respective rights holders and used respectfully and with appreciation in an editorial manner under fair use for the purposes of commentary, criticism and reporting.